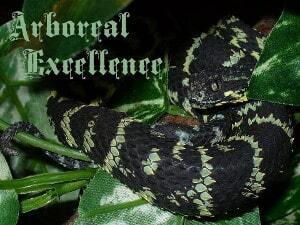 Trimeresurus puniceus is a semi arboreal venomous pitviper species. This is a very durable and resilient species, and is very easy to keep once feeding without a hassle. They have a wonderful range of coloration as well. They are sexually dimorphic with females being bigger than males. Dorsally, Trimeresurus puniceus is gray, brown, or red, with dark blotches or crossbars, which may merge to form an undulating stripe. On each side of the head, behind the eye, is a light streak. Ventrally, it is powdered with dark brown, and usually has lateral series of yellowish spots. I have kept my Trimeresurus puniceus in room temperature for years – both in terrariums & in a rack. They do well in both settings. I house my adults individually, but they generally do well in pairs & trios. Provide space accordingly. I keep my juveniles in about 0.2 x 0.2 x 0.1 meters plastic boxes with small branches and fake plants in order for them to seek refuge. For my adults 0.3 x 0.5 x 0.5 (d x w x h) meters (1 x 1.6 x 1.6 feet) terrarium would do well. I don’t provide hide boxes since I have branches with foliage in my enclosure providing enough hiding place for my snakes. I recommend unfertilized peat as substrate and spraying it roughly 1-2 per week, depending on season/enclosure/ventilation etc in order to keep proper humidity levels. It is recommended to keep a full spectrum lighting pattern that mimics normal daytime (12h cycle). Ambient temperature range of 22–27 °C (72-80 °F) seems to work fine. I keep a hotspot of 30-32 C (86-90 °F) during summer and 28-30 °C (82-86 °F) during winter. In my experience, Sumatrans enjoy the upper temperatures more than Javans. Large bowls of fresh clean water should be offered at all times. With the proposed substrate keeping humidity levels up to 60-80% is easy if you follow the spraying schedule. Of course raised humidity levels up to 90% should occur during shedding cycles. As with all venomous snakes long enough tweezers & tongs for feeding are recommended. Some babies may be tough to get started on feeding. Pinkie parts should be offered until they are brave enough to take down a newborn pinkie. Sometimes it helps if you lift the baby to a flat surface, so they weight of the prey won’t discourage them vs. them dangling the food from a branch. Small fish or frogs can be tried as well. I recommend individual housing for babies, as that makes feeding etc. much easier. Also, I have witnessed one instance of cannibalism, and many instances of littermates biting each other, sometimes resulting in death. I feed babies about once a week. Depending on the size of the meal etc, I tend to feed my adults 1-2 per month on average. This is not set in stone, my feeding pattern is quite irregular. Just make sure they don’t start losing weight, and females that are to be bred should be well fed. Just like with any venomous snake, great caution should be taken when handling this species. 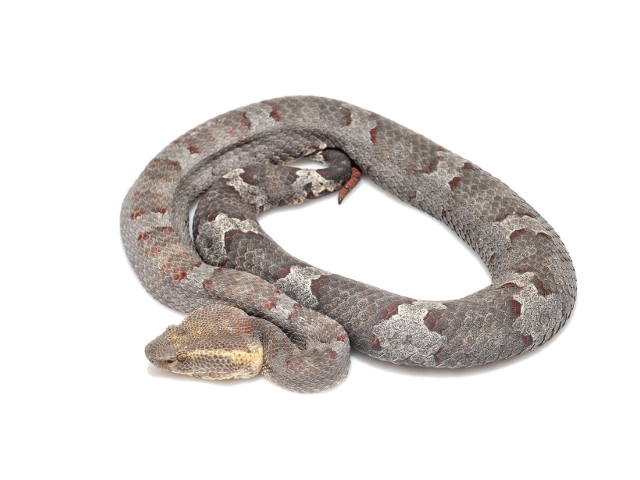 Handling should only be done with the use of hooks and other tools made specifically for the safe handling of venomous snakes. The females are a bit heavy for their size, so a bit of support is nice to avoid too much pressure on their ribs. Free handling and tailing is not recommended and should never be an option. I spot clean my enclosure whenever necessary and change the water every second day. Whenever there is a need, I clean the whole enclosure. Adequate humidity & clean drinking water are important, as these snakes easily learn to drink from a water bowl. It seems to me that especially Sumatran females can be susceptible to impaction as they grow older, so making sure that they are hydrated and defecate is very important. Should impaction occur, there is eventually a risk of prolapse as well, once the hardened feces are passed. It’s very important to not keep Javans too warm, even gravid females rarely use basking opportunities. Babies can go off feed if it’s too warm.